Barbara Walters' visit to Paris this past week had one purpose: an interview with France's First Lady, Carla Bruni. Bruni receives much media coverage not only in France but also all over the world. However, she's not been as ubiquitous a figure in US publications. Till now that is. 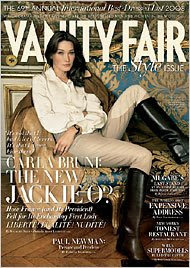 Bruni is featured on the cover of Vanity Fair which will hit the stands on Wednesday and, naturally, Anie Leibovitz photographed her. I admit I now read Vogue. I started paying some attention to it a few years ago and this is one publication I actually do get for the articles. Granted, there aren't many words in there but the few one finds tend to deliver, for the most part. "Elected when he was 52, the high-octane Sarkozy is much younger than French presidents tend to be, having begun his political career as a town councillor in Neuilly, a wealthy Paris suburb, when he was only 22. However, his apparent meltdown over his tempestuous divorce from his second wife, Cécilia, after only five months in office, and his very public courtship and quickie remarriage, just three and a half months after that, to a glamorous ex-model and singer who had been involved with everyone from Mick Jagger to the son of famed Nazi-hunters to a former Socialist prime minister, were a bit de trop even for the French. More galling still were Sarkozy’s penchant for hanging with billionaires and his obsession with celebrity—sporting aviator Ray-Bans as he flaunted a navel-baring Bruni on a vacation in Muslim Egypt." Just why is the world so taken by the Sarko/Bruni union and what could one say about the power of aesthetics? i'll catch the interview tonight. btw, i saw the interview and i guess i get it why the French are crazy about her. i left with a bit of crush too.